Waliguan Observatory (WO) is an in-land Global Atmosphere Watch (GAW) baseline station on the Tibetan plateau. In addition to the routine GAW measurement program at WO, measurements of trace gases, especially ozone precursors, were made for some periods from 1994 to 1996. The ozone chemical budget at WO was estimated using a box model constrained by these measured trace gas concentrations and meteorological variables. Air masses at WO are usually affected by the boundary layer (BL) in the daytime associated with an upslope flow, while it is affected by the free troposphere (FT) at night associated with a downslope flow. 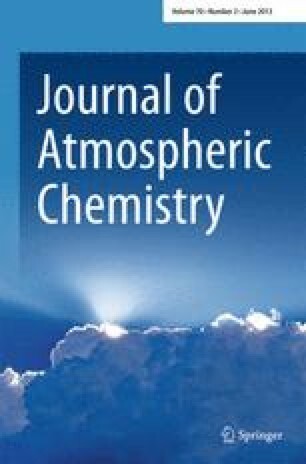 An anti-relationship between ozone and water vapor concentrations at WO is found by investigating the average diurnal cycle pattern of ozone and water vapor under clear sky conditions. This relationship implies that air masses at WO have both the FT and BL characteristics. Model simulations were carried out for clear sky conditions in January and July of 1996, respectively. The chemical characteristics of mixed air masses (MC) and of free tropospheric air masses (FT) at WO were investigated. The effects of the variation in NOx and water vapor concentrations on the chemical budget of ozone at WO were evaluated for the considered periods of time. It was shown that ozone was net produced in January and net destroyed in July for both FT and MC conditions at WO. The estimated net ozone production rate at WO was –0.1 to 0.4 ppbv day−1 in FT air of January, 0.0 to 1.0 ppbv day−1 in MC air of January, –4.9 to –0.2 ppbv day−1 in FT air of July, and –5.1 to 2.1 ppbv day−1 in MC air of July.